Join Cynthia for this month's lesson in quilting on your domestic machine.? You will use the skills you've learned so far to take your quilting to the next level.? We will drop the feed dogs begin to find the creativity within the technique!? Don't worry if you haven't had the chance to take the previous classes, Cynthia will get you up to speed! Quilter Ruler - at least 4" x 24"
My Mom got me started in quilting when I was 17 years old. She saw an add in the local Oregonian for a ?Quilt in a Day? class at the local ?Stretch & Sew? in Portland, Oregon. I took the class from none other than Eleanor Burns herself and bought her book. I was thrilled with the ease of making my first log cabin. This was before rotary cutters so all the strips were ripped. I had an old Kenmore machine at the time (I think it was my Mom?s) and stitched away. I became interested in hand quilting in the 1980?s which was pretty tedious and time consuming. At the time I had no idea that you could get hand quilted results on the sewing machine. What an eye opener when I discovered that!! I met and married my wonderful husband in 1985 and moved to Vista, Ca. In 1990, I found out that ?Quilt in a Day? was in the next town over, San Marcos, and I took the QIAD Teacher Certification class and began teaching. I wrote the ?Lover?s Knot Placemat? booklet after teaching at QIAD for about a year. Simultaneously I was experimenting with free motion quilting and teaching classes to perfect the techniques and wrote the ?Machine Quilting Primer?. In total I have made about 15 log cabin quilts along with so many other quilt designs that I have lost count on the number of quilts I have made over the years. 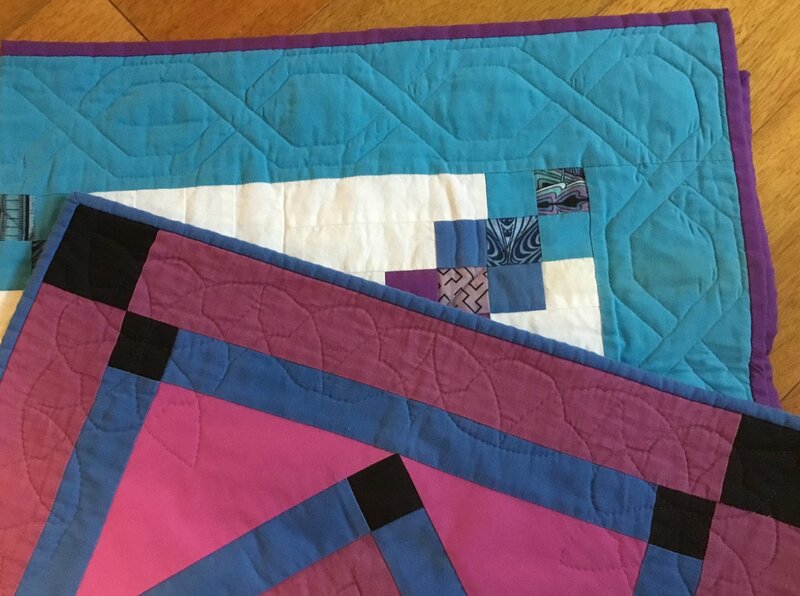 I would love to help you along the path to perfecting your quilting. If there is anything that I can do to assist you, just jot me a note.